Chanel Flores is a research scientist hired by the U.S. government to investigate a mysterious island that appeared overnight at the Bermuda Triangle. As she approaches the remote place with her airplane, the ship is caught on a sudden storm and starts to stall, forcing her to parachute to safety and land on the isle shore. 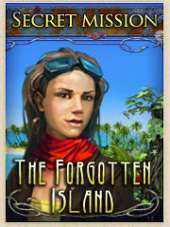 Stranded, she starts to explore the surroundings, soon finding all sorts of bizarre artifacts of a lost civilization, and details about an ancient love story between a castaway and the tribal chief's daughter. Now she must at the same time solve all the mysteries left on the island and find a way back home. This is another hybrid game made for the casual market, combining the adventure and hidden object genres in one title with simple puzzles and mini-games. Unlike their first efforts, this time the gameplay is more traditional and streamlined, with clearly defined sections for the seek-and-find screens and exploratory adventure with inventory puzzles, being closer in design to Department 42. Most of the time, the objective is to explore the many locations of the island, collecting all the objects laying around and solving all the puzzles found on the scenes. The player moves between scenes by clicking on the exit hotspots usually placed at the edges of the screen, or on obvious places like doors and other openings. The inventory objects are stored inside slots at the bottom, from where they can be dragged and dropped on logical portions of the scenery to perform an action or complete a task. Some of the necessary inventory tools are only received after completing one of the hidden object challenges that take place on separate screens, where the goal is to find all the items listed at the bottom interface on locations filled with assorted paraphernalia. The hint button is a blue crystal that highlights the position of one of the required objects, but takes some time to recharge after use. Extra blue crystals can be found scattered around, completely charging up the hint meter when collected. There are various self-contained mini-games and puzzles, where a mechanism of some sort has to be manipulated directly to solve them. They can be optionally skipped after a few minutes.